Support Inventory Pets! Become a Patreon! They Came From the Hotbar! Tired of wimpy pets that always get themselves killed and don’t do what you ask? Looking to add awesome fun and new abilities into your game world? Searching for super cute (and often deadly) friends that will stay by your side through thick and thin? Ever wanted to make a fountain of sheep dance over the open ocean? If you answered YES to any of the above the questions, that’s really swell. But we’re here to tell you about Inventory Pets, not to ask questions. Inventory Pets are living animated creatures that exist in your inventory and give you amazing special effects, drops, buffs, utilities, defenses, and weapons in exchange for care and feeding. Plus, some pets, such as the Purplicious Cow, are especially handsome. There are now a total of 52 awesome, unique pets with mind-bending skills and fancy tricks. © Purplicious_Cow 2015-2017 This mod (plugin, patch to Minecraft source, henceforth "Mod" or "The Mod"), by the terms ofhttp://minecraft.net/terms are sole property of the Mod author (Purplicious_Cow, henceforth "Owner" or "The Owner"). By default it may only be distributed on minecraftforums.net by the Owner. They may not be mirrored or reposted with advance written permission of the Owner. URL shorteners or other attempts to make money off The Owner's Mods are strictly forbidden without advance written permission. This mod is not open source. Yeah, there is a config option... ShowUpdateMessage, set that to false. Using version 1.12-1.4.9.8 we cannot seem to get the quiver pet to work correctly. Tested with a vanilla plain and vanilla enchanted bow. Default config file. When right clicked the pet will play music and consume a feather but rapid shot is seemingly not activated. Also, infinite arrows doesn't seem to be working. Arrows are consumed/shot as normal down to zero. Are we doing something wrong or perhaps it is a conflicting mod or configuration? Thanks for the great mod it's unique and fun! Hey, cannot seem to find any chests in the world to get legendary inventory pets? I have looked in treetops and underground dungeons I have discovered, but I still can't find any. Also, I can't find any clouds with pets on them. Do I need to have clouds on for this or are they an exception? Hey mate, 1.12 works great except that iron nuggets already exist in minecraft and are crafted the same way! I will remove these at the next update. I guess another one of our ideas made it into Vanilla. There is no issue with the textures in 1.10.2, could be a conflict with another mod. Certainly not a crash. 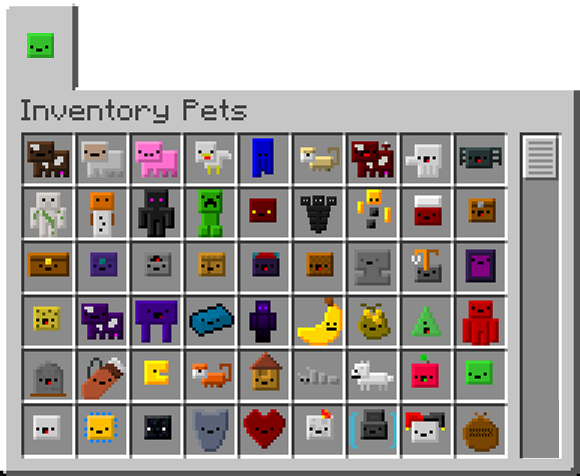 Recommend a fresh installation of Inventory Pets. There was no other pod while I was only in the inventory pets mode! But the Inventory pets mode has 1.12 textureler! Love the mod and thank you soooo much for fixing the Night Vision compatibility issue! Cannot open Feedbag in newest update without causing client crash. Issue posted. Edit: This was fixed in the most recent update. can i put this in my modpack Thanks in Advance Best Mod too! Yes, of course, just give Purplicious_Cow credit, and link back to the forum. Also can you add the fountain of sheep dance over the open ocean?